of the hits you remember in the highest quality sound. We ship worldwide! Order safely and securely online! Click here to learn more. SEARCH here for a specific SONG TITLE or ARTIST on any CD on this site. Tip: try using quotes around all or part of the song title or the artist. (Examples: Paul Anka or to know him). Fans of this critically acclaimed series have been waiting a decade for Eric Records to deliver more sonic sensations and stereo rarities from the late 1960s. 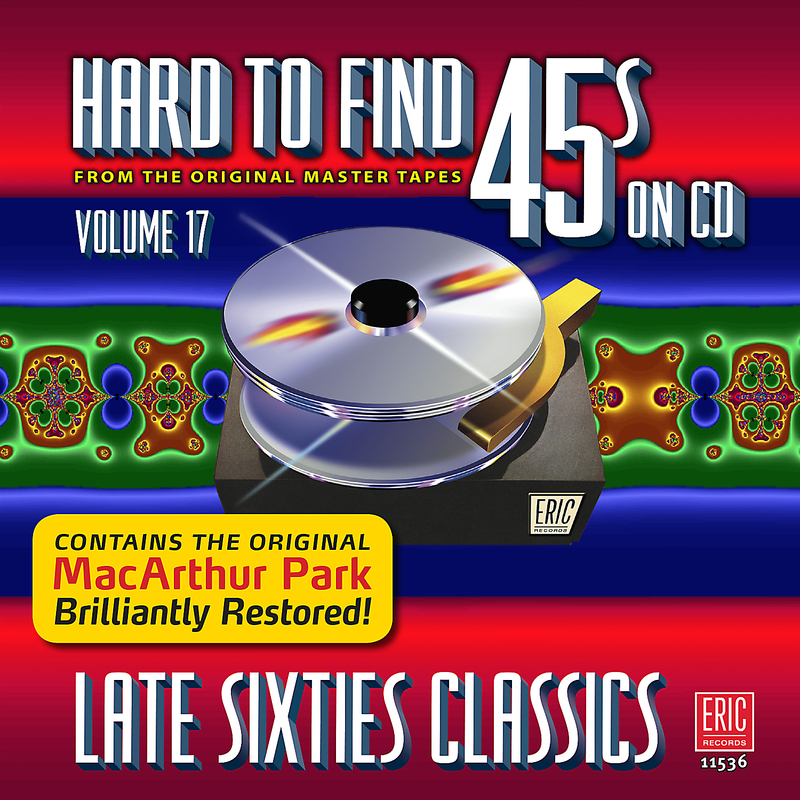 Now its here  Hard to Find 45s on CD, Vol. 17: Late Sixties Classics  and its spectacular! Youll hear 21 beautifully remastered songs, 16 of which were Top 10 hits and 8 that appear in stereo for the first time ever! Hearing the classic psychedelic hits Incense And Peppermints (Strawberry Alarm Clock), Psychotic Reaction (Count Five), and Youre Gonna Miss Me (Thirteenth Floor Elevators) in stereo is like hearing them for the first time! Also appearing in stereo for the first time anywhere are British Invasion favorites A Groovy Kind Of Love (Mindbenders), Gimme Some Lovin (Spencer Davis Group), and The Mighty Quinn (Manfred Mann) along with the #1 novelty hit Winchester Cathedral (The New Vaudeville Band). But the crown jewel here is the brilliantly restored MacArthur Park by Richard Harris. This hit has never sounded this good on CD  or anywhere else  since its original release. Youll feel like youre sitting in the orchestra! No other label puts as much care and effort into providing the correct versions of the original hit singles you remember in the best sound quality. Its a great value, too  65 minutes of hits not available in audiophile-quality like this from download services like iTunes and Spotify. Includes a 12page booklet with complete song-by-song annotation and liner notes by Greg Adams. No matter how many collections of Sixties music you own, you havent heard anything like this. Check out the sound samples below! SIXTEEN TOP 10 HITS! 8 MAJOR STEREO DEBUTS! Note: All tracks stereo, original 45 rpm single versions (unless noted). Chart positions taken from Joel Whitburns Record Research series of Billboard chart books. All content on this site © Eric Records Inc.
Eric and the Eric Records logo are registered trademarks.